In general I view actually running the game at a convention a bit akin to trying to advertise it. At least to a certain extent. It’s usually fun on top, yet my main motivation has been to get the word out and make players happy. Two goals that do work better with stuff to show and touch. I made pictures of two sets, though at the table it was like one big set. Though, in hindsight, at the table, I noticed that it might have been nice to have a signature card, or stuff. I brought my two, trusty printouts of the rules and scenario along. To check for info, and to hand it to interested spectators. I do, of course, respect that White Wolf would like to receive feedback, thus I had the URL and QR-Code ready. On top of the printouts you’ll see golden and magenta colored tokens. I took those from my curse the darkness Kickstarter reward, or the Forsooth Kickstarter reward, … the big pile of Kickstarter stuff. They were used to indicate locations on the map. Like Golden for the Golden Gate, blue for the rest. The choice of stones proved a bit light. I provided 2 sets a 10 green d10 and about 20 red d10s. Usually players on German conventions bring their own dice. Yet the requirement to have to different colors called for prep. Plus, I like taking my dice out. The green sets are classic V:tM dice. One with normal ones, one with ankhs for 1s. The red dice included a lot of dice from Trigger Happy, as well as some random ones. Next to those is a map of Berlin. 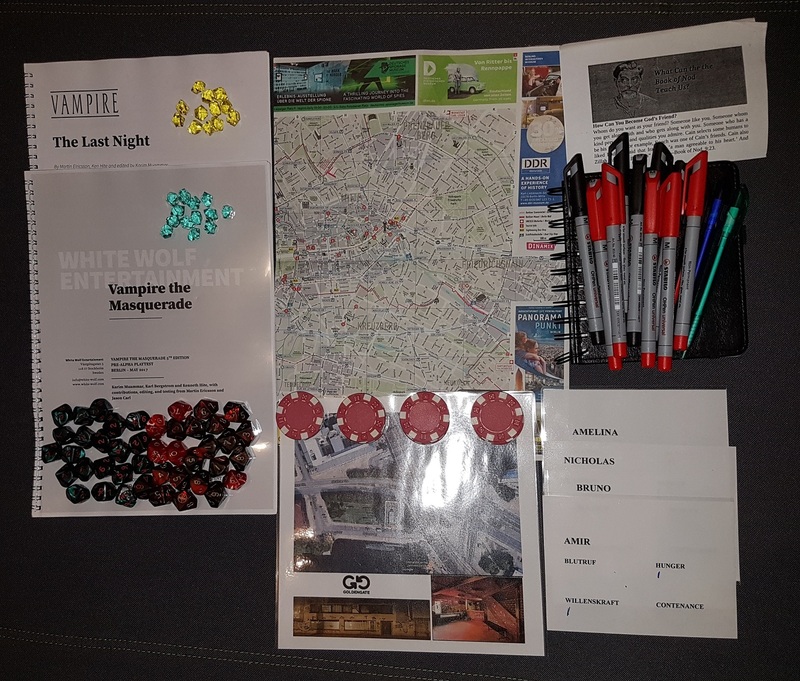 I got one spare map from staying in Berlin during the World of Darkness Berlin event, and thought it made an exquisite handout / prop. It did. 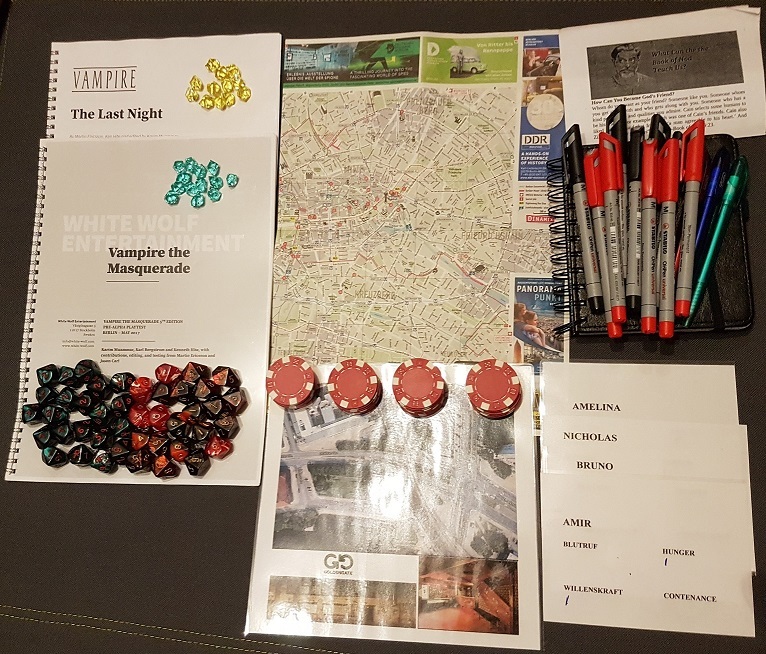 Between the map and the handout, you’ll see are red poker chips. These were used as tokens to keep track of „Blood roused“. Which did work quite well. Right under the chips there’s a handout for the Golden Gate club. I took a google maps screenshot with „earth view“ and used it as a map, to visualize the scenery. I did then google the logo, mostly for flair. Plus I took two photos of the internets to visualize the club. The whole thing got laminated. For durability, and for markings. On the top left you find a flyer for the church of caine. It’s been a handout during Enlightenment in Blood, and served as atmospheric prop. Right beneath the flyer is a note book, 5 black non-permanent markers, 5 red non-permanent markes and three pens. My pencil is absent from the pictures. The markers where aqcuired because I lost my old ones, and to enable everyone to keep track of stuff on the laminated handouts. Every character got a small handout prepared. To keep track of their „Blutruf“ (Blood Roused), „Hunger“, „Willenskraft“ (Willpower) and „Contenance“ (Composure). The poker chips usually got placed on their blood roused section. In the upper left corner you’ll find two ST facing handouts. The first one offers a small overview over some of the characters stats. The second one should have enabled me to keep track of the players temp stats. I used neither as intended. They are both laminated. Thus I turned them on their back, to use the blank area to draw maps. Though I had an empty paper laminated as well. Just in case. Side note, I love using „stinker“ my lamination machine (he does produce a certain stink while laminating), and laminate everything possible. Its sooo practical. On the top right you’ll find the info printouts. Sporting a QR Code and the URL. To enable players, and spectators, to find the V5 PreAlpha and give feedback. It did got actually used and I was pleased. Though I did consider adding some advertisement for my fB community and blog, in hindsight. To the lower left you’ll see an empty V5 character sheet. Laminated of course. For durability and such. I used it to explain the rules. I considered to use it to translate stuff, yet I haven’t had enough time. Missing on the picture is an example of the character sheets. 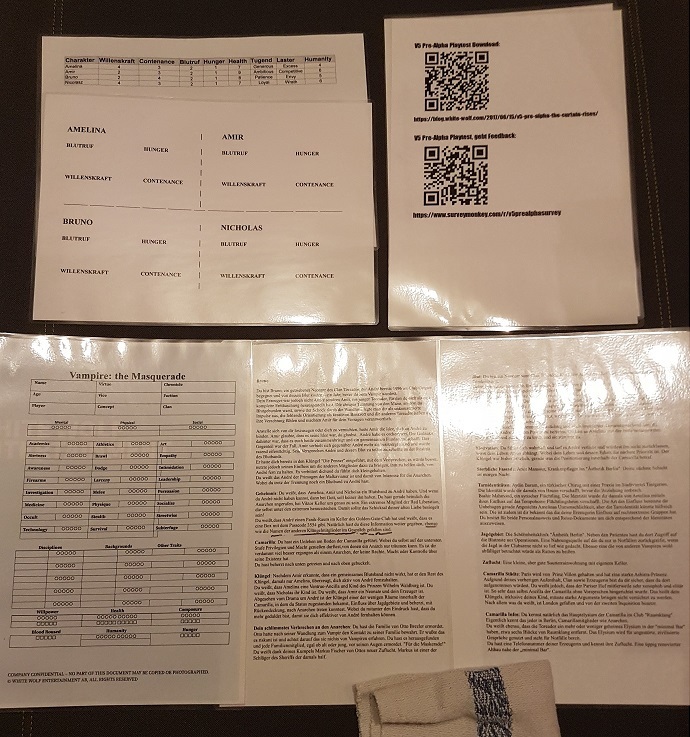 I simply printed out mine (introduced in a previous article) and laminated those. I think players were fine with em. Next to that you find a first page of the background, of a character, close to the second page of the background. It’s in German. 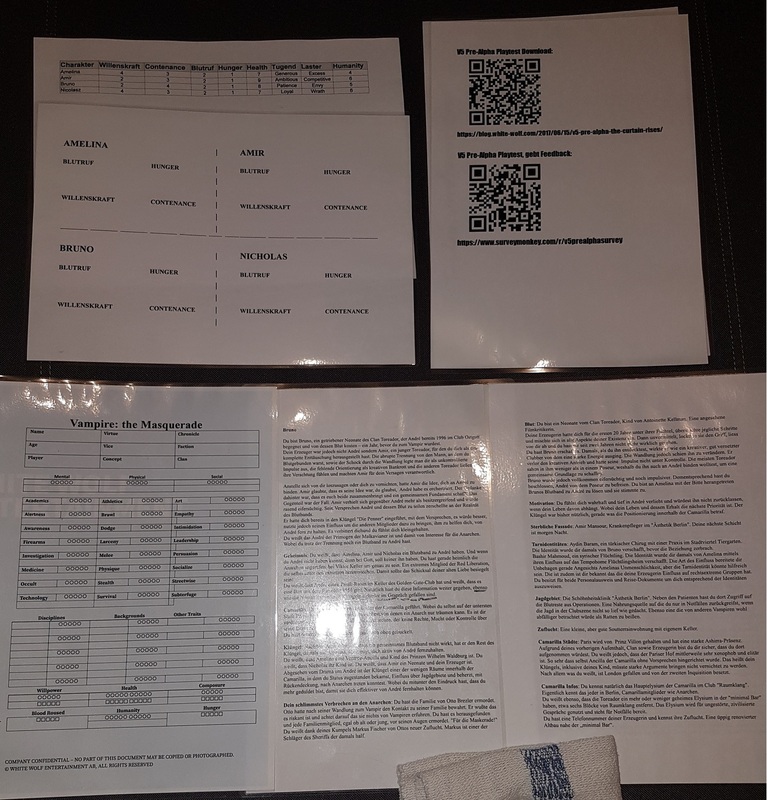 For I couldn’t reasonably asks players to read a two page, English background before playing. Safe from a few hiccups – my German wasn’t thaaat good and I had to highlight (the underlining) the betrayal aspect for Bruno – they did their job. Last but not least, when working with non-permanent markers and a lot of laminated stuff, you will like to have a towel around. Next to some water. To actually clean sheets as well as for players to remove markings. If you got comments, suggestions, critic or more, feel free to leave feedback.